﻿ Grotesque Guardians In Old School Runescape! While looking at the Old School Runescape Dev Blog we came across a very interesting post about adding Grotesque Guardians to the Slayer Tower. It sounds a very interesting idea. The reason the devs have come up with this is that they feel not enough people get to take on the Gargoyles as they require a lot of skill and only the higher level slayers get to experience this. So adding in a new slayer boss, the Grotesque Guardians gives those mid-level players who are at 75 Slayer a cool slayer boss to take down. You will need to reach the roof of the Slayer Tower to face them. To do this you need to get a brittle key (which cannot be traded) you get this when a Gargoyle dies and you can use this key to permanently unlock the Slayer Tower roof. Once you have unlocked the roof and if you are on a gargoyle assignment, you can fight the Grotesque Guardians. There will be unique drops when you kill one of these guys. Granite Dust will be dropped after every single Grotesque Guardian kill. You can use this make granite coated cannon balls which are pretty cool. 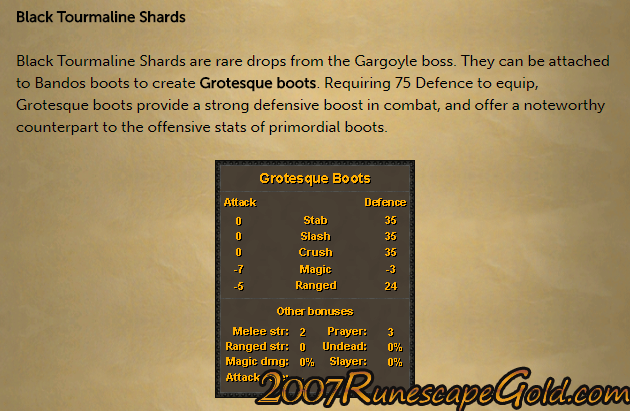 Black Tourmaline Shards will serve as the rare drops and this can be used to create Grotesque Boots, but you need to attach them to Bandos Boots in order to do so. We really like the idea of having a really cool and badass mid-level Slayer boss and we really cannot wait to hear more about this. There is even talk of redesigning the Gargoyles so that they fit in with the look of the Grotesque Guardians. Be sure to look at the dev blog and also have a look at our low prices on Old School Runescape Gold!